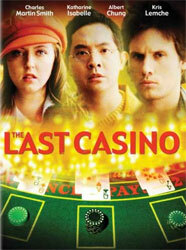 The Last Casino is a Canadian film of 2004 which was based on the book of Ben Mezrich Bringing Down the House. As far as we know, there is one more movie can be found which was based on the same book, and this movie is 21; this fact makes someone think that 21 is a remake of The Last Casinoâ€¦ Anyway, both films are worth watching and both of them tell about the young team of card counters who come to Las Vegas with the plan to beat blackjack and win much money. The university professor of mathematics named Doug Barnes is in a very difficult situation now: he owes a lot of money to one gangster. He tries to win the needed sum in casinos but was not successful with doing that, and was banned from visiting casinos as a result. But Barnes's problems are not important for the Usurer (the name of this gangster): he needs his money back and does not want to hear about anything. So, Doug Barnes decides to form a team of card counters who will help him to get money quickly; the professor tells the Usurer about his idea and the gangster accepts it but cuts Barnes's little finger as a warning. Awards: The Last Casino has won 2 of 6 nominations.